The arrow was found in a wound close to its eye. The RSPCA believes it will survive the injuries, although a spokeswoman said it had a "lucky escape". Police are hunting the attacker. 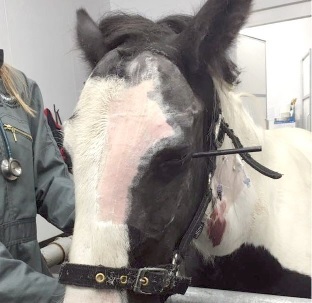 A £1,000 reward has been put up by the owner of the yard where the horse was kept for information leading to a conviction. The horse is currently at the Royal Veterinary College, near Hatfield, for treatment. RSPCA deputy chief inspector Mel Fisher said: "It seems this poor boy has had a very lucky escape, though the next 48 hours will be crucial. "The arrow has gone through his eye socket and into his nasal cavity, miraculously without hitting anything vital. It's hoped he won't lose his eye but it's too early to know for sure. "This was a wicked attack on a friendly and sociable little chap." Det Sgt Dan Stoddart from Hertfordshire Police said: "This appears to be senseless, cruel crime and we are doing all we can to find the person responsible."